The plan shows gradual (perhaps even piecemeal) 'erosion of the urban grid', as promoted by Hilberseimer […], developing the area north [!] 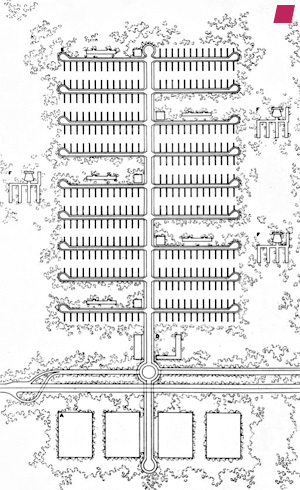 of Marquette Park, Chicago (W 67th Street - W 59th Street) from a high density grid typology to a low density fish spine [ladder] (cul de sac) structure, projecting an 'Urbs in Horto' garden eden city ideal. In its [unintended] reversal - true insight!